While no one would want their house or apartment to go up in frames, the reality is this can happen anytime. For this reason, it is always good to be prepared. With the increase in number of people losing their lives and sustaining grave injuries as a result of fires in the building, you need an all-inclusive fire prevention system in place. Most of the buildings including homes have fire extinguishers and saving ax for emergencies, but we all know that this is not enough. When the fire is uncontainable, you may be forced to look for a way to move out of the building. In story building, this may be a problem especially when the fire has blocked the entry and exits. However, with the best fire escape ladders, you and your family escape unhurt. The fire escape ladders are designed for portable, easy setup and ergonomic use. They come in a compact storage bag that fits in a closet, under the bed and other tight spaces where you can access easily in case of an emergency. These ladders are incredibly fast to set up, works with multiple windows frames, and sills giving you fast escape a fire. Before you can settle on the best model, it is crucial to ensure that you get the best model. For this reason, we have reviewed the top 10 best fire escape ladders that stand out from the rest. In emergencies, there is very little to think of; this is why this fire escape ladder is made very easy to use. There is no installation needed, and you can set up in less than a minute. Having a height of about 14 feet, you can climb down a two-story building with incredible ease. The unit is crafted from strong steel to ensure extra strength and maximum durability. 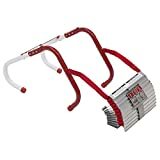 The Kidde 468093 emergency ladder comes in a unique, tangle free design that enables the user to set up in less than 30 seconds and get to safety. It is decently sized to allow your family to climb down a two-story building with ease. This ladder is tested to hold up to 1000lbs, so you don’t have to worry about it breaking. This is not all; this model has anti-slip zinc plating for secure footing. Being prepared for an emergency can help you save lives. 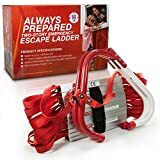 This escape ladder stores compactly and deploys easily in case of an emergency. It is a 13 ft ladder making it suitable for individuals who live in two story building or apartments. The ladder is light in weight, small and attaches to window easily. In addition, this unit is tested to hold more than 900 pounds so you can be sure that it won’t break as you climb down. Fire is a serious threat that can strike anytime. Arming yourself with this emergency ladder can help you together with your family escape a fire without any injury. This unit is desired with sturdy hooks that hook to any window frame securely. It is super easy to deploy thanks to its lightweight design. The ladder is tested to hold up to a thousand pounds. Storage doesn’t need to be a concern as it fits under a bed or closet conveniently. Although nobody wants to think about a fire breaking in their home, if the house doesn’t have any escape route, you need to have an emergency ladder. This ladder cones with steel hooks that attach securely to any window frame or sill. It is incredibly light in weight and will deploy in seconds. This makes it easy to use for both kids and the elderly. You shouldn’t put a price on safety, but sometimes our budget doesn’t allow us to purchase premium products because of their high price. However, this is an affordable escape ladder designed to allow you get to safety in case of a fire outbreak. Made from high-quality materials and simple set up design, this escape ladder is there when you need it most. 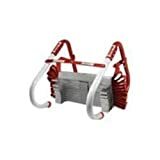 Engineered to offer you an easy way of escaping from fire outbreaks from apartment, house, condo and office buildings, this emergency ladder means the difference between being trapped in a fire and escaping without any injury. It deploys easily because it is parachute loaded at the factory making it ready for use. Saf-Escape emergency ladder boasts heavy-duty construction ensuring ultimate performance. Unlike other models, this unit is made with a wider and longer design making it safer and easier to use. We love its ergonomic and user-friendly design to ensure the best performance. It is crafted from tangle-free steel chain that supports a weight of up to 1000lbs. This is a 13-foot ladder making it ideal for placement in your house or apartment second story. The ladder is made using premium materials to ensure durability, stability, and reliability. It is always a good idea to have portable chain ladder in fire escape plan especially if you live in a story house. This is a 45 ft portable emergency ladder made using strong steel chains while remaining light in weight. This makes it super easy to use. Incredibly strong, this Saf-Escape emergency ladder is tested to 1000 pounds in weight. It is extra long making it a perfect choice for individuals living in 4 to 5 story buildings. It attaches to most windows and walls of up to ten inches deep.